Assuming iPad 3 (or whatever the next iPad is called) gets the much rumored and highly anticipated ‘retina’ treatment, the screens resolution would come in at a whopping 2048×1536 pixels. 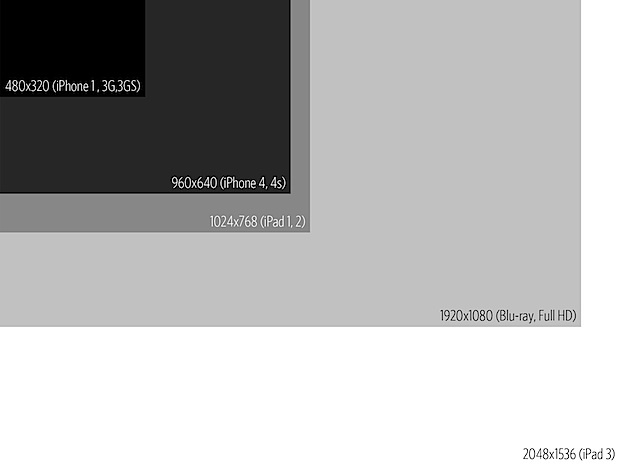 That’s an enormous amount of pixels for a screen that isn’t even 10″, and to help convey just how large that is comes an image from clkoerner that compares the rumored iPad 3 resolution to other common resolutions, including the original iPhones, retina iPhones, prior iPads, and a Blu-ray full HD 1080p movie. Click here to see the full version, be prepared to do a lot of horizontal and vertical scrolling. As we’ve mentioned before, there is currently no Mac screen capable of displaying a resolution of that size natively, which will pose an interesting challenge for developers and designers to prepare artwork and apps for the next iPad. That fact combined with recent evidence and rumors have led many to believe that Macs with high DPI displays may arrive soon after iPad 3 is announced, although this could be just wishful thinking. A refreshed Apple lineup complete with ultra high resolutions? Let’s hope so, we’ll be finding out soon enough. The web is going to look like garbage on a screen that size, nobody makes graphics for that DPI. Technically it wouldnt really look any different then it does now. Still all pixalley and stuff. But look on the bright side, once we hit a high enough PPI we won’t need any more resolution after that. So we can start focusing on optimizing to that. As for the appearance of the web, given the numerous options available for delivering a proper, well thought out interface to the multitude of varying devices and screen sizes it would be foolish to optimize for just one. There are tons of applications where people have said “we’ll just stop right there.” Most innovations go this way. We move on to something else entirely at some point. vinyl records, tube televisions, incandescent light bulbs, wired telephones, books, everything. You can make a case that megapixels in cameras and megahertz in computers are right there too: good enough, let’s concentrate on something else (low noise sensors in cameras, multiple processors in computers). Dorje is likely quite correct, once we have enough pip, people will move on to something else. I think you mean the same thing when you say there are “…numerous options for delivering a proper , well thought out interface…,” I just thought I’d point out the distinction. Giving up on great, so we’ll have time to improve something else is hardly uncommon, nor, a failure. you can’t compare screen resolution with megahertz and things like that. The screen resolution for computer displays will indeed STOP at some point once it is large enough to satisfy our eyes’ needs completely. Same as happened with audio: we could digitize audio at Megasamples/second, but you never find standard audio systems going over 96 ksamples/second. At some point it will not be anymore about resolution (or sampling rate), but other things such as color quality, contrast, refresh speed, noise level and so. Megahertz in computers on the other side have no “it-is-enough” limit. The faster, the more complex things you’ll be able to do, there is no inherent limit to the complexity that you want to achieve. Same for memory, disk size and so on. No limits there! Yup just as they did wit cds when we were told early on this is perfect sound. HD, Full HD, Retina Display…. What happend to the days when we could just say “this display has a resolution of 800×600”, or “1920×1200”? Besides that, a high res display on a tablet should make reading easier on the eye, good stuff. I agree with you, it is all marketing talk and people are so ignorant to follow like a sheep. The name doesn’t say anything about the resolution. The same thing when people think HD telivision is 1920 x 1080 but 1280 x 720 is also HD. 1280×720 maybe HD but it is not the same 1920×1080 – especially when you talking about computer / tablet resolution. I am actually having trouble with higher resolution screens – this is because I getting older and my site is not as good as I was when I was younger. But I believe there is a technical reason why they made the screen that size. If you notice it exactly 4x or 2×2 on each side of iPad. This is done because iPad apps can early be scale to new screen. Hopefully iPad 3 specific apps could be scale back. This is not marketing decision, but a technical reason. Because for non-technical people, a word is easier to understand and remember than a pixel count. They’re not sheep. In fact, you seem to be the ignorant one. Retina = Individual pixels cannot be distinguished at the standard viewing distance. A retina screen is a relative term. It’s a function of pixel density and viewing distance, which is why the iPhone will have a higher PPI than this rumored iPad 3. I want a LED back light LCD screen with even white balance and true blacks, so no more white spots. And a 100% color accurate screen without having to do any form of calibration. But apparently a higher resolution is more important…. the IPS displays in the iPads (like the iMacs) give some of the best colour accuracy out of the box. Backlight bleed can be an issue, and until OLED becomes cheap enough, True blacks won’t happen. A higher resolution *is* more important. These devices (and I’m including Androids) are (mainly) for screen reading and game play. Videos (in order to not look too blurry) will have to be HD or “better”. I for one welcome our increased PPI overlords. I don’t like seeing pixels when I read, and do not on my iPhone 4. The only other thing I have to add is.. if you have an unlimited data plan, you might want to either hang on to it, or move to a provider that does not throttle –as AT&T is doing to their longtime users, myself included, as of this writing. For anyone who does not: I see you on WiFi a lot, or overages in your future. I would MUCH rather see a comparison of like-sized images at different resolutions. For instance, take an image that is 5MP, and produce images of differing DPI’s, and put them side by side. What will this do to battery life and the graphics performance need to drive these pixels? I suspect battery life is going to suffer. They will advertise as “the same great battery life as before” or something similar, but just like iPhone 4S is not nearly as good as iPhone 4, the battery life will take a 20-30% hit in real usage. That is my bet. The iPhone 4 has the same screen as the 4S … so not sure why your phone has worse battery life? Her name is Siri and she talks behind your back. Good story, but the silliness of responses is unsettling. I would expect those who comment on Apple product would at least realize what is viewed on the screen would be normalized to the display size. And the iCones continue to play catchup. Be realistic – Apple has a policy of keeping the production cost of their products as low as possible – iPad 2 has the same production cost as an iPad, iPhone 4s, 4, 3gs, and the 3g all have lower production costs than the original iPhone. How would Apple possibly be able to maintain production costs on the iPad 3 if they include retina display?